There’s something that will, at times, both confuse and irritate me, and that’s when popular series that everyone seems to love I tend to despise with a burning passion because I think it’s a load of crap. But, somehow, everyone seems to love it so much that if I were to try and talk about what I hated about the series, people would flip out on me and tell me “What?! No! It’s the best thing ever! !” One such case revolves around the series I’m taking on today. People may get angry for what I’m going to say, but it’s my opinion. I’m not the almighty otaku god so just calm down and don’t take it personally! Sword Art Online is a 25 episode Action/Adventure/Drama anime based on the ongoing light novel series by Reki Kawahara and published by ASCII Media Works. The anime from A-1 Pictures and director Tomohiko Ito originally ran during the Summer 2012 season. As of this review, SAO has been licensed by Aniplex of America (US), Manga Entertainment (UK), and Madman Entertainment (AUS). A second season named Sword Art Online II is currently airing in Japan and with Aniplex of America as the only known licensor. You can find the series streaming on Crunchyroll, Netflix, and Hulu. In Japan, a new virtual reality MMORPG game has just been released called Sword Art Online. People scramble to get themselves a copy and begin to play right away! However, once the players have assembled in this virtual world, they learn they have no way of logging back out. What makes matters worse is that if the player were to die in the game, they would die in real life. The only way to win and free everyone from this world is by beating the final boss at the top of the SAO world. 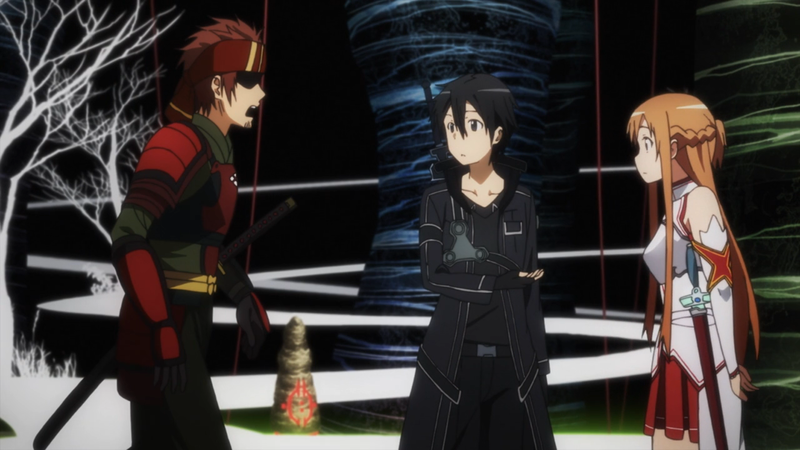 Kirito, a beta tester of the game, decides to work his way to the top and release all the players trapped in this virtual world. Also the action is pretty awesome! If I were to tell you that this series, more than likely, had a larger budget you would probably believe me once you saw the animation. A-1 Pictures tends to be consistent with their animation like Production I.G. making this not all that surprising. 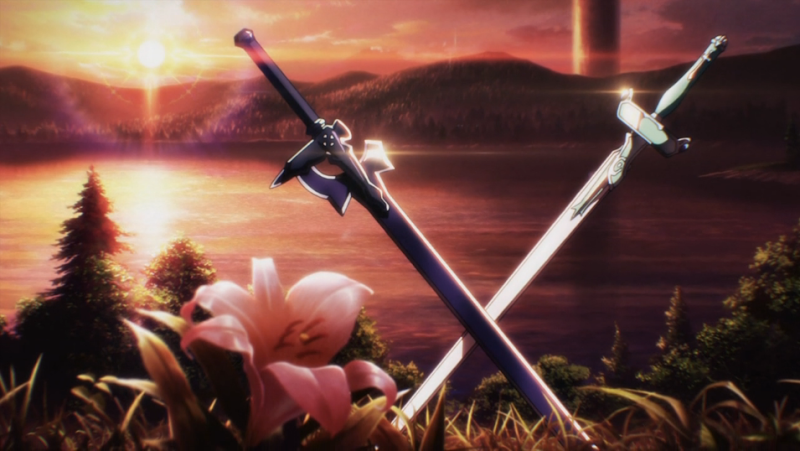 Sword Art Online looks amazing with such beautiful, and sometimes even terrifying, worlds that are created. However, like many other big budgeted 24-26 episodes series, there is sometimes a drop in animation quality every once in a while. It’s not a huge problem, but it still is fairly noticeable if you know what you’re looking for. As for the soundtrack, this is the third time I’ve encountered Yuki Kajiura, but it’s the second time I’m talking about her. Many orchestral and choral sounds can be heard here, and it’s pretty much become a staple of her work. Don’t believe me? Have you seen Fate/Zero or Madoka Magica? Exactly! The theme songs are also not too shabby, with the first opening “Crossing Field” by LiSA being the most enjoyable. The music, overall, is one of my favorite parts of the series! However, it’s one of the only things I actually liked. Here’s where I start getting into a lot of problems. 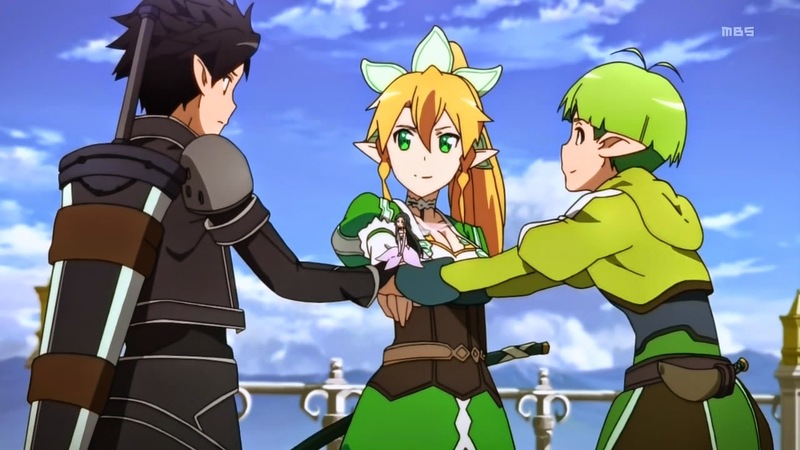 The story of Sword Art actually had a really strong start! The world that was being built and the consequences that were being put in made the whole thing seem much more harrowing then one would originally believe. However, after the third episode, the steep decline of the story began. 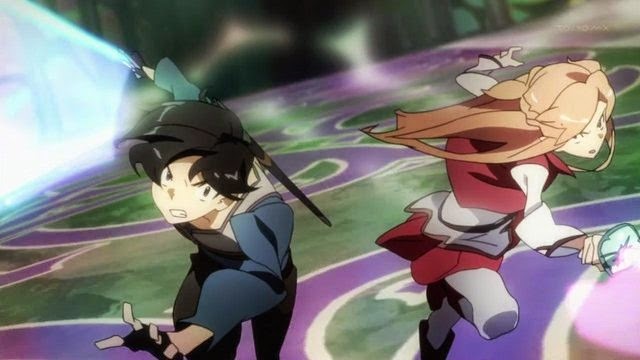 The initial premise of the series' first half just disappears and is replaced by a mix of time skips, filler, and harem for our main character, Kirito. I’m not joking here. There’s at least two to three individual episodes where Kirito and a female player go out and do something. Not only that, but the romance between Kirito and Asuna actually seems rather forced. It doesn’t help that their characters are written rather poorly as well, but I’ll get to that in a minute. As for the second half of the series, there wasn’t really any point in it being there. The series could have ended after the first arc and called it a day, granted with some slight writing changes. However, this pointless second half just takes the story and nose dives into the ground with the only real plot line centered around Kirito and Asuna’s relationship. It almost seems like the only reason this half was created was so the viewer can have their cake and eat it too. 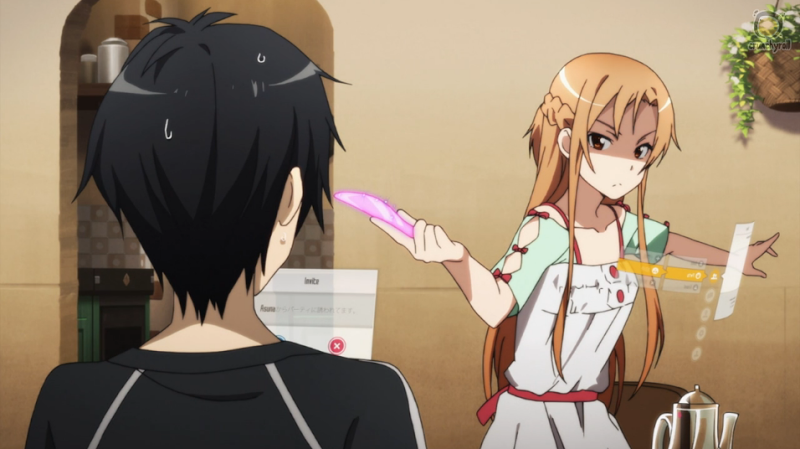 Also, because Asuna being trapped and almost sexually assaulted has to happen in the series at some point. Ya know, gotta have that fan service! The ending of the series actually wrapped up a lot better than I thought it was going to. It was rather satisfying with no hint of a second season appearing. Originally, when I spoke to my friend Matt (MadShadow) we had come to the conclusion that the only way more of this franchise would be produced would be as a spin off, even though he still believed they would magically create a second season regardless of how it ended....... I really hate that he was right about that. Although the story took a crash landing, the under developed characters did not save this series in the least. It’s possible that the character writing is even worse than the actual story! Asuna and Leafa’s characters are probably the most saddening to see this happen too. 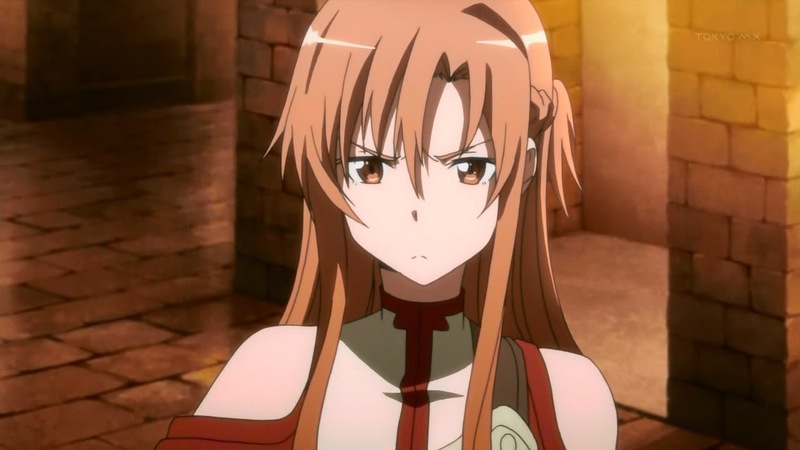 For Asuna, her introduction in the series was really awesome and badass that you’d think would equal a strong female character. Yeah, no. By the next time we see her, she’s turned into a tsundere character who, as Anime Zone’s Giggrk puts it, “can’t do anything without her f***ing boyfriend!” Again, the forced romance doesn’t help this either. Not only that, but Asuna’s character is so poorly written that she ends up in a Princess Peach scenario for the second half of the series. 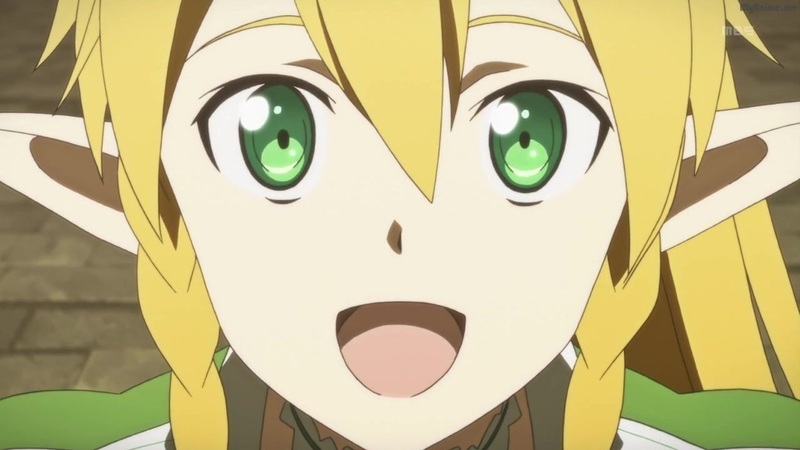 As for Leafa, her character really just isn’t given time to grow and instead ends up stuck in this rut and can’t get out of it. Not only that, but Sword Art goes into a very different route with her character that, because of spoilers, I won't talk about. But it's pretty bad.... The majority of the secondary characters are rather mixed. You have the ladies of Kirito’s harem who get that one episodes to hang out. Then there’s some of the male secondary characters like Klein and Agil who are interesting but we don’t see all that much. Lastly there’s the villains who are either confusing as to their motives or so insane that it’s hilarious! 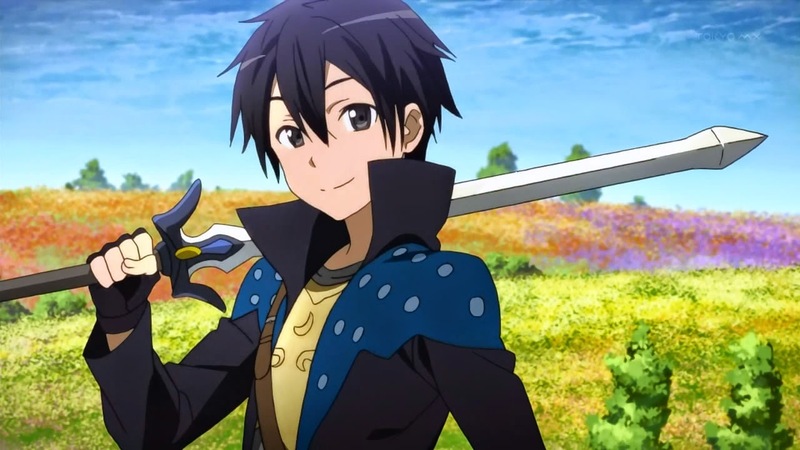 But, of course, we can’t leave out good old Kirito. There’s a term being tossed around in order to describe his character, and it’s so accurate that I can’t think of any other way to describe him. 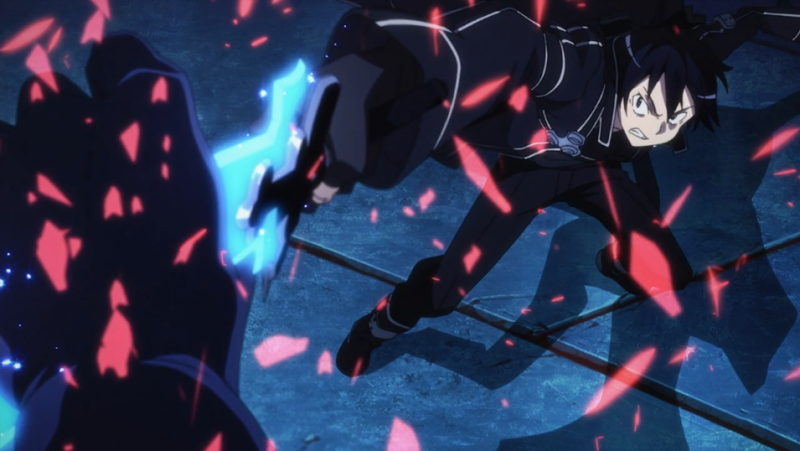 Kirito is a wish fulfillment character. He’s so powerful, so badass, and somehow manages to attract all the ladies. Not only that, but the writing makes it so he can accomplish things that you can’t normally do if you play an actual MMO. Couple that with some of the deus ex machina junk that gets written in, and you have a character that will save the day no matter what happens. Even if he were to get into a knife fight in the real world, some bull s**t is gonna go on and save him. Can you tell how much this series irks me? 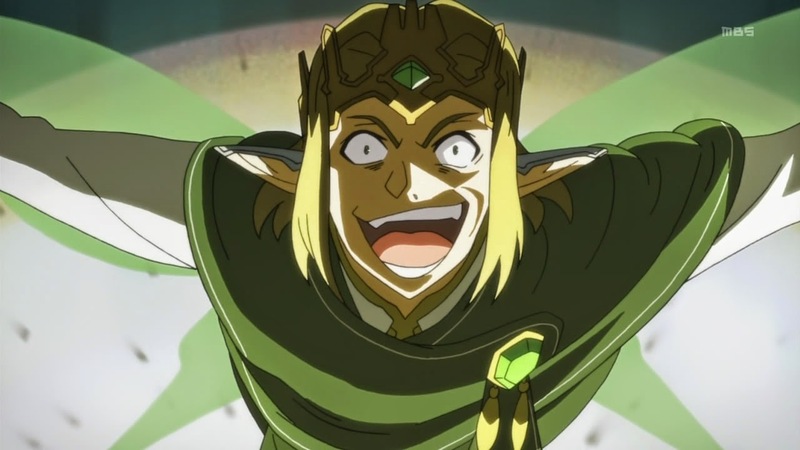 "You should address me as his highness, TODD F**KING HABERKORN!" Originally, when I watched the series two year ago, I saw the Japanese. This time, I watched the dub. Because I don’t even remember the Japanese all that well, I’ll stick to talking about the dub. I’m also sticking with the dub because it was kinda painful. There wasn’t really any stand out performances here. The only ones I can think of that I moderately enjoyed were Kirk Thornton’s (Samurai Champloo, Black Jack) Klein and Patrick Seitz’s (Deadman Wonderland, Monster) Agil. There’s also Todd Haberkorn’s (xxxHolic, Fairy Tail) performance as Sugo which was a mix of crazy and hilarious that I kinda can’t help but appreciate the effort in getting out of your normal range. Natsu, why you creeping on Lucy? Sorry, had to say that. Speaking of Fairy Tail, Cherami Leigh (Soul Eater, Sailor Moon) takes on Asuna and the performance took some time to get into. It wasn’t terrible or anything like that, because by the end she fit into the role well. I just wish that the character herself was a lot better, giving Leigh a chance to really shine. However, she’s not the one I have the biggest problem with.... That honor, unfortunately, belongs to Bryce Papenbrook (Attack on Titan, Vampire Knight) and his performance as Kirito. This one took even longer to get used to, with moments where the voice just didn’t match the character. I’m not sure if there was an issue in the scripting, the directing, or Papenbrook himself but this is one of the more upsetting roles I’ve seen him take on. His role in Vampire Knight was a lot more fun, that’s how disappointing this is! Thankfully, his recent work in Attack on Titan is calming me down, however I do have Blood Lad sitting on my shelf now and I’m curious to know how that went for him. A few other mentions for the dub include Cassandra Morris (Toradora, K-ON! ), Marc Diraison (Fate/Zero, Samurai Deeper Kyo), and Stephanie Sheh (Bleach, Eden of the East). Okay! Now that I’ve basically finished ranting about the series, here’s the thing. I know people really do enjoy the series for what it is, and it even got some new viewers into the anime world. That’s something I can understand. There were times where I did find myself enjoying the show or even getting teary eyed during parts. But, if you have a wasted premise and wasted character potential, then it makes the series just an utter disappointment in the end. Even with all the action and all the nice technicals, without a good story and interesting characters for you to invest your time in, it can make it that much more difficult to get through in the end. Honestly, if the writing and characters were a lot better than I could see this as something really amazing! It just didn’t accomplish that because there is a thing in this world called terrible writers. That’s all there is to it. But do we really have to make this series as taboo a topic as the Shonen Three? Seriously? Can’t we all just get along? 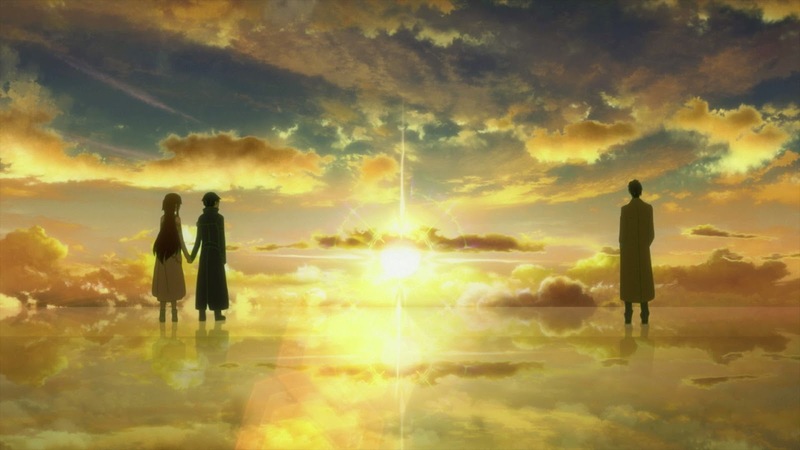 By the end of our virtual nightmare, Sword Art Online had so much potential but is just wasted on a poorly written story and very underdeveloped characters. While the animation and soundtrack amazed and the dub was average at best, it’s so hard to overlook the glaring flaws. It is very action packed and I did enjoy myself, but you really REALLY need to turn your brain off on this one. I can say that some anime newcomers may enjoy this a lot, however the older anime fans may be much more on the fence. Next time, we suffer from a little PTSD in a strange new world. Until then, otaku on my friends! Final Rating - 4/10 All that potential.... Just wasted.... At least it’s looks pretty.